This article appeared in Architectural Review Asia Pacific #126: Architecture and Infrastructure. 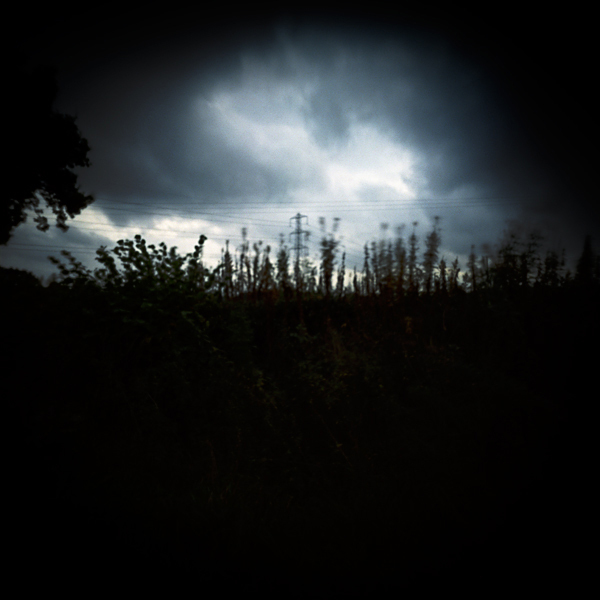 All images and poetry from I Spy Pinhole Eye (Philip Gross, poetry, and Simon Denison, photography, Cinnamon Press, 2009). The Royal Institute of British Architects (RIBA) recently organised a competition for a new design of the electricity pylon. This competition – following similar ones in Iceland and Italy – called for a replacement to the 1927 design commissioned by architect Sir Reginald Blomfield. Variations of this design exist around the world, its precise shape and form varying from country to country. They are a legacy of 19th-century engineering, vast lattice-framed structures that march uninhibitedly across the landscape. 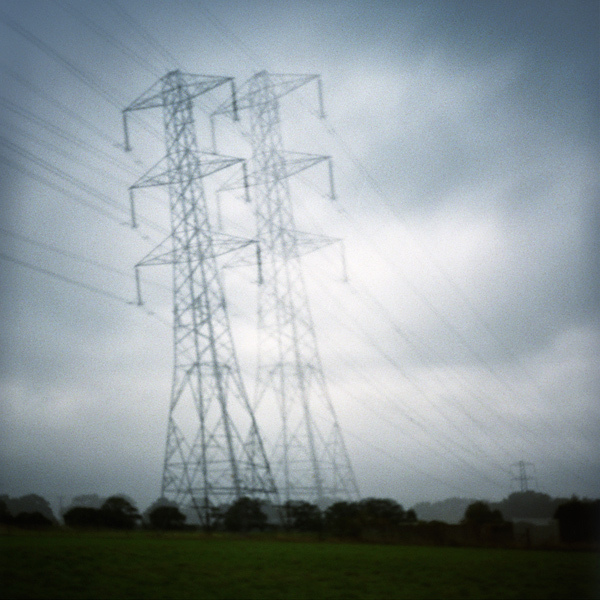 Pylons have a paradoxical place in the contemporary imagination, simultaneously decried as monstrous impositions on the natural environment or, more often, simply ignored. The name ‘pylon’, which derives from entrance markers to Egyptian temples, suggests some deep significance, but they are just as often dismissed as ugly, utilitarian structures. Their ubiquity means that they often go unnoticed, a necessary evil like road signs and radio transmitters. Despite their size they are oddly delicate structures. Their steel latticework lends them a ghostly quality, describing the outline of something massive like a semi-transparent monster. Sometimes they twist to allow the cables to change direction, the ‘arms’ of their insulators flipping like a robot caught mid-movement. Once a week I drive through the North Downs of Kent in England. On the way I pass by a mobile phone mast disguised somewhat ineffectively as a tree. I always notice this slightly absurd object, a metal cylinder with stubby, tube-like branches and a little aerial growing from its top, even though I’m clearly not meant to. The irony of this is made more acute by the fact that I barely register the long line of electricity pylons that stagger across the same valley. The different ways that these two pieces of infrastructure are treated – one semi-comically camouflaged and the other naked and unadorned – reveal interesting things about our attitude to the relationship between nature and technology. Proposals for new lines of pylons are often vigorously opposed by conservation and heritage groups who suggest that the cables they carry be buried underground. Along with wind turbines and power stations, pylons represent the most visible incursions of technology and infrastructure on the landscape. By necessity they are also found in remote areas where their juxtaposition with supposedly unspoilt countryside is most acute. Despite the obvious benefits they bring us, we remain disturbed by their presence, anxious not just to disguise them but to banish them from view altogether. Burying electricity cables is arguably a more disruptive and insensitive process than installing pylons. It doesn’t negate any impact on ‘nature’, but merely hides it from view. Like similar opposition to wind farms, such arguments are far more about preserving the visual character of the natural world than protecting its physical exploitation. We bury things in order to get rid of them. Tunnels transport things, usually dirty things, away from us. Despite the effort and ingenuity involved in their construction, we don’t celebrate these buried bits of infrastructure and the kilometres of pipelines and cables that bring comfort and convenience to our lives. 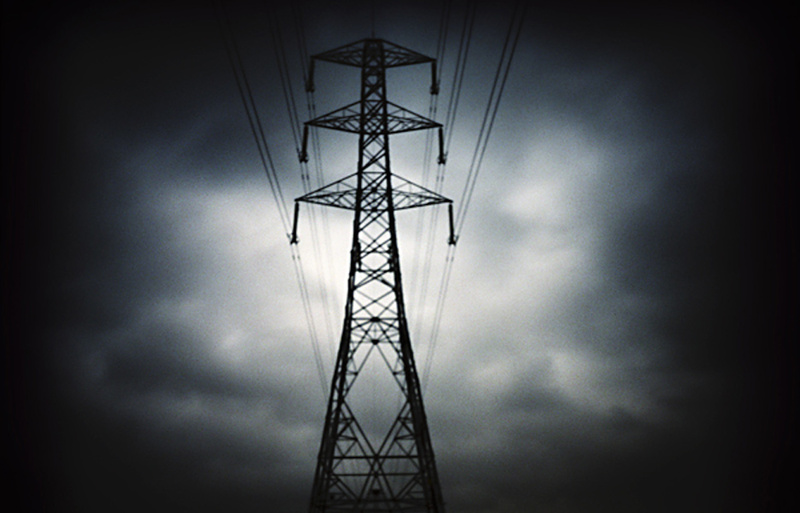 Pylons are one of the rare instances when such things break cover and appear before us, in some ways a monstrous representation of our relentless consumption. There is something both bracing and mysterious about them. Their scale is often breathtaking, offering a glimpse of the vast, literal grid of technology that surrounds us. The presence of pylons disturbs the delicate pact we make with the natural world, which we simultaneously exploit mercilessly and sentimentalise. An example of this can be found in the long-running battle by local residents to avoid an extension of the national grid through Dedham Vale in Suffolk, England. This area is also known as ‘Constable Country’, after the landscape painter John Constable who lived and worked there. It is a major tourist destination and bus and walking tours ferry visitors around, stopping off to visit the specific views Constable painted. The preservation of these views arouses intense feelings, not least because of the financial and cultural value they provide. In Dedham it is specifically the view that is being preserved, rather than the way of life or the industry depicted in Constable’s paintings. In an advanced industrial country like the UK, the countryside has long ceased to be a place of employment for the majority of people. Its appeal has shifted from a place of production to one of leisure and (visual) consumption. Picturesqueness, prettiness and the image of history provide contemporary sources of employment and revenue. The fact that Constable portrayed the landscape as a place of utility and industry is a source of unacknowledged irony. His paintings frequently focus on water mills and hayricks, barges and canal locks, industrial machines that transformed the countryside into a place of production. Despite the fact that the character of our contemporary landscape was formed by centuries of inhabitation and production, we continue to search for the ‘unspoilt view’ and a mythical, prelapsarian idyll. Among the British architecture group Archigram’s most provocative designs was the LogPlug. Designed by David Green in 1969, the LogPlug was an electrical power point concealed within an artificial branch lying on the ground as if recently fallen from a tree. This small, seemingly flippant object managed to perfectly satirise society’s schizophrenic attitude to the relationship between nature and technology. The LogPlug (and its near cousin the RockPlug) assume a buried network of electrical and data cables able to pop up anywhere, camouflaged to blend in with their natural environment. They encapsulate both a desire for limitless technological connectivity and for that technology to be largely invisible. Green’s work with Archigram anticipated what is now known as ‘the network society’, the invisible web of mass-communication technology to which we are all connected. The LogPlug project’s sardonic adoption of faux-rustic imagery to accompany this network has an echo in the camouflaged phone masts and thatched bus shelters that occur in sensitive landscapes, albeit with considerably less surreal humour. Despite its prescience, none of the entrants to the recent spate of pylon competitions adopted Archigram’s satirical tactics. RIBA’s brief accepted the argument that burying electricity cables across large areas of countryside is prohibitively expensive and instead asked competitors to “design a pylon that has the potential to deliver for future generations, whilst balancing the needs of our communities and preserving the beauty of our countryside”. Most of the designs – both in the UK and elsewhere – were surprisingly similar to the existing pylons, self-consciously literal echoes of heroic Victorian and Edwardian engineering. Among the numerous examples of expressionist structures and vaguely vegetative forms, however, two particularly stood out. Choi + Shine’s entry achieved an honourable mention in Iceland’s competition but was banished to the ranks of also-rans in the UK. It depicts a series of giant people built from the familiar lattice framework but sculpted into recognisably human form. 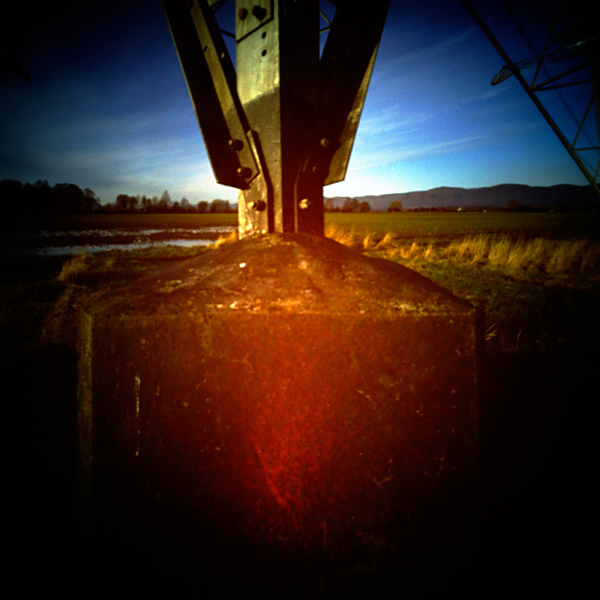 The design made explicit the latent figurative quality of pylons. A series of male and female giants hold the electricity cables aloft, adapting their position in relation to the immediate topography. They are both funny and extraordinary, appealing to our fascination for giants and grotesquely over-scaled objects. Also buried in the un-shortlisted entries to the UK’s competition was a very peculiar design by architecture practice H and J. Unlike all the others, their entry was hand drawn and appeared deliberately antiquated. The competition boards had scroll-like banners and employed a florid, neo-medieval font. The main image depicted a series of bizarre follies ranging from UFO-like forms to odd jumbles of logs like a giant catapult, and, perhaps more predictably, a castellated tower. Druid-like figures drifted across the fields in the foreground as if ruminating on the meaning of these bizarre structures. The drawings note that each tower should be “unique and resplendent”, a deliberately archaic form of language. The pylons themselves are described as generating power from renewable sources including “photovoltaic cells, wind turbines … and love”. Noticeably, no power lines run between the various towers. Instead – and this is where the proposal perhaps loses a certain amount of credibility – “orbs” of energy would be transported by trained monkeys through a network of underground tunnels. It’s a bit of a shame about the monkeys, because H and J’s proposal is a beacon of humour and surreal wit in an ocean of neo-expressionism and high-tech literalism. It suggests that technology doesn’t have to look like technology. It shows that our image of technology is part of a preconceived visual aesthetic, one that refers inevitably to the first products of the industrial revolution. H and J’s proposal harks back to a different design tradition, one where technology is hidden behind fantastical, frequently neo-medieval structures. To the modernists, the Victorian habit of hiding the remarkable steel structures behind gothic and neo-classical frontages was aesthetically dishonest. Such objects stem no doubt from a certain shame, a desire to disguise the shock of the new with comforting and familiar imagery. But they are also bizarre and compelling objects in their own right. It is perhaps overly simplistic to dismiss them as mere pastiche. Far from displaying a fear of technology, they may in fact suggest a comfort with it. They recognise that technology needs to be shaped and its forms deliberately authored. Technology often escapes scrutiny by appearing to come from nowhere. It is seen instead as the product of inescapable forces, things to which we can either submit or resist. I’m not suggesting a spate of joke pylons, or a return to a faux-medievalism. But the pylon competition entries I have picked out suggest a more communicative form of infrastructure design, one that allows for explicit symbolism and visual meaning alongside pragmatic and functional concerns. Like the electricity pylon in the shape of a pair of Mickey Mouse’s ears in the Disney town of Celebration, in Florida, we can actively shape infrastructure into objects of communication.